I tried to give this book away back in July, but the winner never claimed the prize. What a shame for him, but a bonus for my other readers. 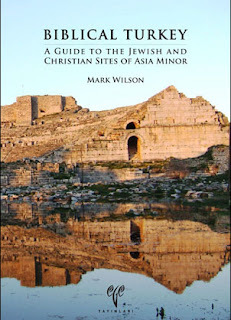 Today I am giving away Mark Wilson's Biblical Turkey: A Guide to Jewish and Christian Sites of Asia Minor (Ege Yayinlari ,2010). This is an excellent resource that I used both before and during my recent trip to Turkey. Mark Wilson has lived and guided in Turkey for more than a decade and is also a fine New Testament scholar. I have known Mark for almost 20 years and highly recommend his book. He combines important historical, archaeological and biblical information in an easy to use guide. I believe that Mark's guide will become for Turkey what Jerome Murph- O'connor's guide has been for Israel. Biblical Turkey is an authoritative and comprehensive guide to the ancient Jewish and Christian sites in Turkey. It includes all the references to cities, regions, provinces, and natural features in the Hebrew Bible/Old Testament, Apocrypha/Deuterocanonicals, New Testament, and Apostolic Fathers. Special features include Side trips, which point to nearby sites that are also of interest to visitors. The In-Sites help readers to read between the lines for special insights into the biblical text. In the Ancient Voice section writers from antiquity speak about the ancient world of Asia Minor. Colorful photographs and plans of selected sites illustrate the volume. If you would like to win this signed copy of Mark's book put your name below. I will pick a winner on Sunday. Remember, you must check back to see if you won. You then have 5 days to claim your prize or it goes back on the shelf. Did We Get Jesus Right? 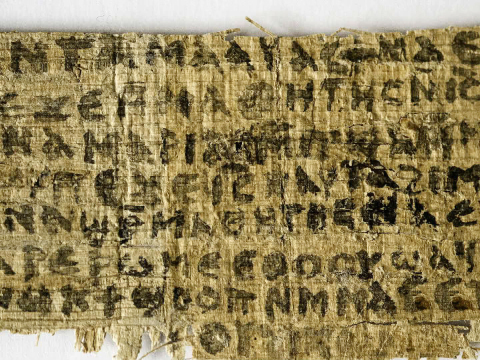 Simon Gathercole looks at the apocryphal the gospels. Simon Gathercole is a New Testament scholar at Cambridge University, and a fellow Durham grad. His most recent work is on the so-called Gospel of Thomas. In the following video Simon looks at the New Testament gospels and the apocryphal gospels. I continue with a peek at my commentary on Paul’s letters to the Thessalonians. Today I look at 4:13-14. An examination of this section usually leads to a discussion of the rapture. However, I want to focus not on Paul’s eschatology, but his pastoral ministry to the grieving. Paul’s pastoral heart is evident in his stated desire for them. He does not want them “to grieve like the rest of mankind, who have no hope” (4:13b). If not read carefully Paul’s admonishment could be understood as suggesting that believers should not grieve for the dead. But this is contrary to the examples of Jesus and Paul, both of whom were moved to grief over a friend who had experienced or come close to death (Jn 11:33-35; Phil 2:7). The focus here, however, is on what makes the believer different in their grief. It is not that they don’t grieve, but that they grieve with hope; a hope that they will see their friends and loved ones again someday. And this is what makes the Thessalonian believers so different than the rest of the world around them. Death, Paul is reminding them, is not a permanent end to life. It is not an eternal sleep. On the contrary, as Paul will explain elsewhere, it is a transition to a new and better life in resurrection (1 Cor 15:50-54). Death has a way of putting everything into perspective. It’s not that we are not aware of death. It is all around us every day, but it doesn’t always touch us personally. Then a spouse, a family member or a close friend passes away and we stop and wonder what it is all about. In some ways death can be a gift to us because it forces us to stop and consider, even if for just a few days, about our own mortality and the meaning of life. Christians are not immune to the effects of death. Unless Jesus returns in our life time, we will all die. The difference between us and those who are not followers of Jesus, however, is that we believe that this is not all there is; that there is more than the seventy or eighty years we are blessed with here. For us, death is a new beginning. I was 29 years old when my father died. He was 51, a Christian and approached his death with hope and confidence in the promises of God that death was not the final act. But for those of us who were left behind, it has not always been easy to hang on to that hope and confidence. Numerous times since my father died I discovered that my grief would continue to well up again and the fresh realization that he was gone reopened the wounds. At the same time, 1 Thess 4:13-18 has been my go to passage for finding some solace in his death. Along with 1 Corinthians 15 it is the theological foundation for my hope that death is not the end. Over the years there has been a song that I listen to that expresses the hope I hold onto as a follower of Jesus. The song is by the Christian rock group Petra and is based on the promises in 1 Thessalonians 4 and 1 Corinthians 15. Here is a part of the lyrics that seems to always get me. Where is the sting, tell me where is the bite? Where is the victory, where is the prize? Whatever one may think of Petra and their music, the theology of this song is correct. The main point of Paul’s words in this passage is that it is ok to grieve for those who are gone. The difference is that we don’t grieve like those who do not know God. We also don’t grieve without hope because Gods’ resurrection of Jesus is the basis for our own hope of resurrection. Without the resurrection and eventual return of Jesus there is no hope. When teaching or preaching this passage one thing to keep in mind is that Paul is comforting the Thessalonians and reassuring them that grief is natural. The whole point of explaining the return of Jesus and the order of the resurrection is so that they could “encourage one another” (4:18). As the church of Jesus Christ we need to be able to provide hope and comfort to those inside and outside the church. Simply telling someone to “keep their chin up” is not enough. Paul is not suggesting that they not grieve, that would be inhuman. John Stott describes grief this way. Bereavement is a very poignant human experience. However firm our Christian faith may be, the loss of a close relative or friend causes a profound emotional shock. To lose a loved one is to lose a part of oneself. It calls for radical and painful adjustments that may take many months (Stott, The Gospel & The End of Time, 92). Still, some will struggle with their grief and the how and if they should express it. They may feel conflicted about grieving the loss of a loved one knowing that they will see them again at the resurrection and Jesus’ return. In those cases I find the example of Jesus to be helpful. In John 11 we have the story of Jesus raising Lazarus from the dead. But it is also a story of Jesus expressing grief for a dead friend. John 11:35, the shortest verse in the Bible, says: “Jesus wept.” But here is the twist. Jesus knew that Lazarus was going to live again. Not at some future point in the general resurrection, but that day, in just a few moments. In fact, Jesus told Martha just a few verses earlier that “your brother will rise again” (11:23). And yet Jesus wept. I can’t think of a more poignant example of good grief than that which is displayed in this story by the person who is the resurrection and the life (11:25). Yes our confidence and hope is centered on the resurrection, but like Jesus, we are grieved when the effects of sin and death are manifested as we wait for the completion of the new creation. 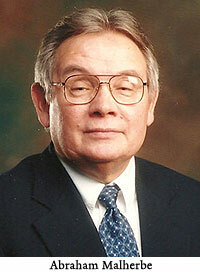 I just learned that Professor Abraham Malherbe died on Friday. The following is taken from a tribute to him on the Yale University web site. Abraham Malherbe, the Buckingham Professor Emeritus of New Testament Criticism and Interpretation at Yale Divinity School, died suddenly and unexpectedly on Friday, Sept. 28 from an apparent heart attack. He was 82 years old and taught at YDS from 1970 until his retirement in 1994. He was named the Buckingham Professor in 1981. Malherbe was a prolific author and made major contributions in several areas. He is best known for his work in Hellenistic moral philosophy and early Christianity, especially the Pauline tradition. He made contributions both to Hellenistic moral philosophy and to the ways in which early Christians were influenced by it. His work on The Cynic Epistles: A Study Edition (1977) and Moral Exhortation: A Graeco-Roman Sourcebook (1986) made a number of important texts available to the wider range of scholars. His “Hellenistic Moralists and the New Testament” (ANRW) may hold the distinction for being the most cited forthcoming article in the history of New Testament studies. Both before and after its appearance, this article provided a framework for scholars to think about how to appropriate Hellenistic moral philosophy. Malherbe did this in detail in several of his own books, especially, Paul and the Thessalonians: The Philosophical Tradition of Pastoral Care (1987), Paul and the Popular Philosophers (1989), and his Anchor Bible Commentary, The Letters to the Thessalonians 2000). He was working on a commentary on the Pastorals for Hermeneia when he died. I am reading Malherebe's commentary on 1 & 2 Thessalonians as I write my own commentary on the epistles. I has a chance to meet him in August of last year at the annual SNTS meeting. He will be greatly missed. My fellow blogger and biblical studies colleague, Tim Bulkeley has written a new book about how we understand God. 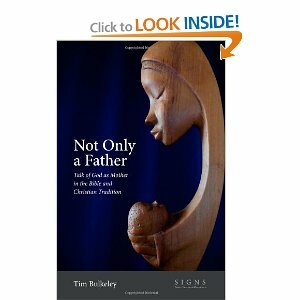 The title of the book is Not Only a Father: Talk of God as Mother in the Bible and Christian Tradition. You can buy the book either as a paperback at Amazon for $15.00 or you can read it online and interact with what Tim has to say by leaving comments. As James McGrath notes, this may be the future of books. I have been away for a few days and am only now reading about some of the developments related to the so-called Gospel of Jesus' Wife. Below are three of the most helpful developments. It seems that enough doubt has been raised by some that Harvard Theological Review has decided not to publish Karen King's article at this time. In the mean time, The Smithsonian Channel has decided to delay airing the documentary that was supposed to be on this evening. Some there also seems to have some questions. Finally, below is a a short video from Christian Askeland over at Evangelical Text Criticism in which he explains why many are suspecting that the fragment is a fake. 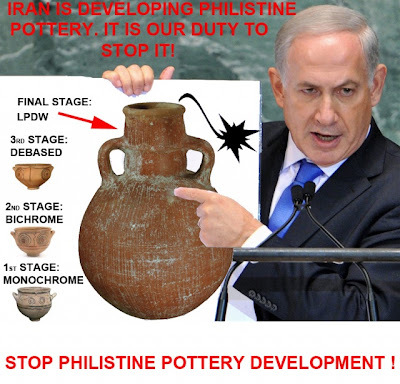 With thanks to Aren Maeir at the Tel es-Safi/Gath project. Congrats to Andrew Gleddiesmith. He is the winner of this week's giveaway. Andrew, send your details to me at jbyron@ashland.edu and I will send you the book. Remember, you have 5 days to claim your prize.